EDIT: Kitsy Lane has officially shut down... therefore, the structures and income methods described in this article are no longer valid. The article is kept for historical reference only. I'm a firm believer that, if someone offers you a means of making money with "nothing to lose" and tells you that they have "nothing to gain" from your participation, it's a lie. So, why would I share this with you? The answer is actually blatantly simple. It's because I DO have something to gain. 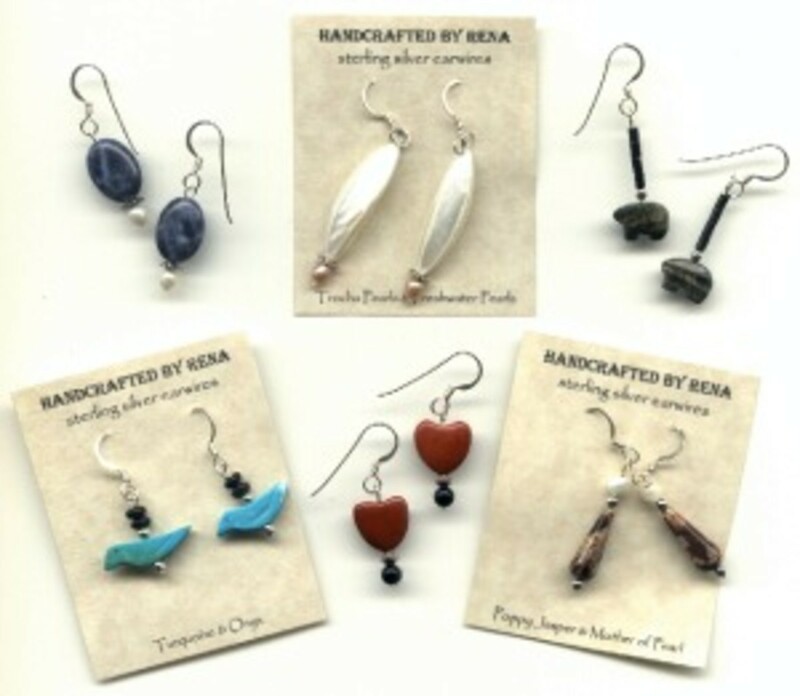 In the interest of full disclosure, the link I'll give you is to my wife's jewelry boutique. If you use her link to sign up, she gets paid. And, since we're in a joint income household, it effectively means that I get paid. So, there's my motive... Simple, right? No, this isn't an MLM scheme. No, there's no pyramid and you don't have to form a team. No, using someone's invitation link doesn't take any money away from you. No, you don't have to buy inventory and keep a bunch in stock. No, you don't have to buy a website (it's provided for you). No, you don't have to host "parties" to get people to buy jewelry (although, I suppose you could if you wanted to). Got any more doubts or questions? Ask! The cool part about this program is that it costs nothing to launch other than a little time and some social interaction that you're normally doing any way. The entire system is web-based, so it's accessible from anywhere. Ready to learn? I'm sure you're anxious to get started... If you want to get a general idea of product types and layout, you can do so by browsing through the Beautiful You Boutique. Or you can skip all of that and head right over to the sign-up page to become an owner. The landing page will look like this, though the graphical layout may be slightly modified to best suit your monitor. Nevertheless, take the time to read the rest of this hub and get an idea of what to expect. 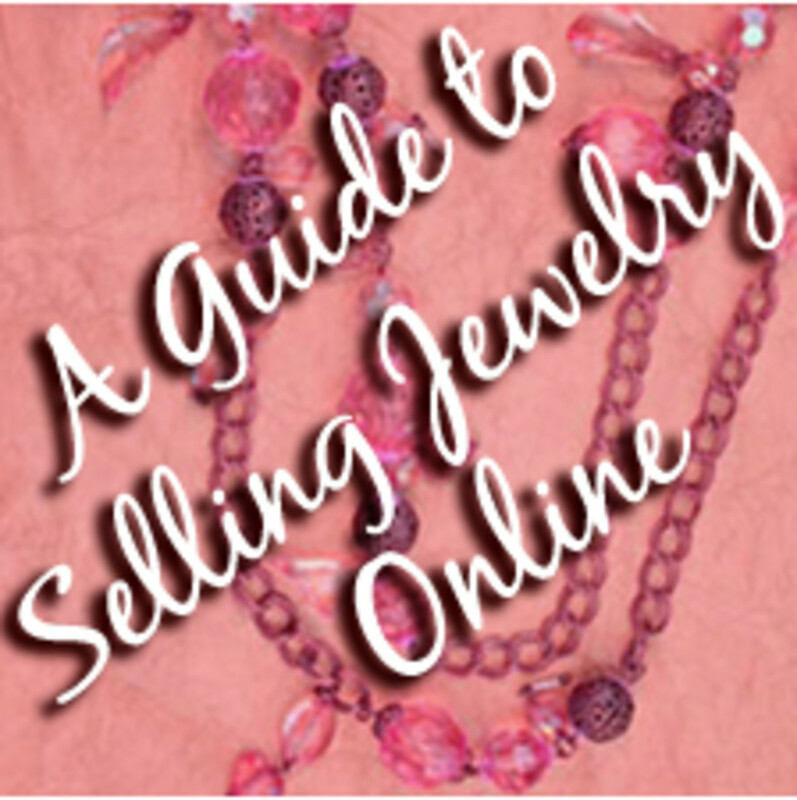 Landing page to open your jewelry boutique. Enter your e-mail address to get started. While you're at it, have a quick look at the introductory video on the sign-up page for a brief overview of the parent company, Kitsy Lane. It's only a minute and a half long... Go ahead, I'll wait. 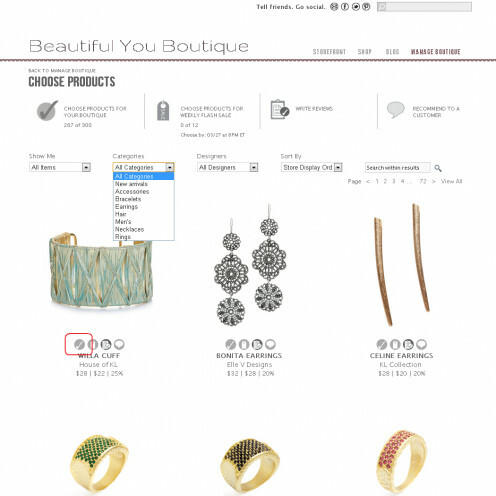 Furthermore, each user has the option to create up to five boutiques. You can use them for different themes or abandon a name you don't like by registering a different one. For the purpose of this exercise, let's just focus on one... your first. During the setup process, you'll complete your owner profile and customize your boutique layout with a multitude of colors, fonts, logos, and themes. You'll also have an opportunity to write a welcome message to your customers or keep the default message already in place. If you get sidetracked or otherwise lost, remember that you can access your boutique dashboard by clicking "Manage Boutique" in the upper right corner (highlighted in this image). The "To Do" list allows quick access to some of the utilities you'll use most often. Once you're satisfied with the layout and theme of your boutique, you're ready to start adding some awesome jewelry! "Fill your boutique with pieces you curate from an ever-changing catalog full of emerging designers and on-trend house brands." What does that mean to you? It means that you can select products from Kitsy Lane's catalog (up to a limit of 300 units) to display in your boutique. Sort products by category or view them all at once... To add a product, click the check marks like the one highlighted in this image. 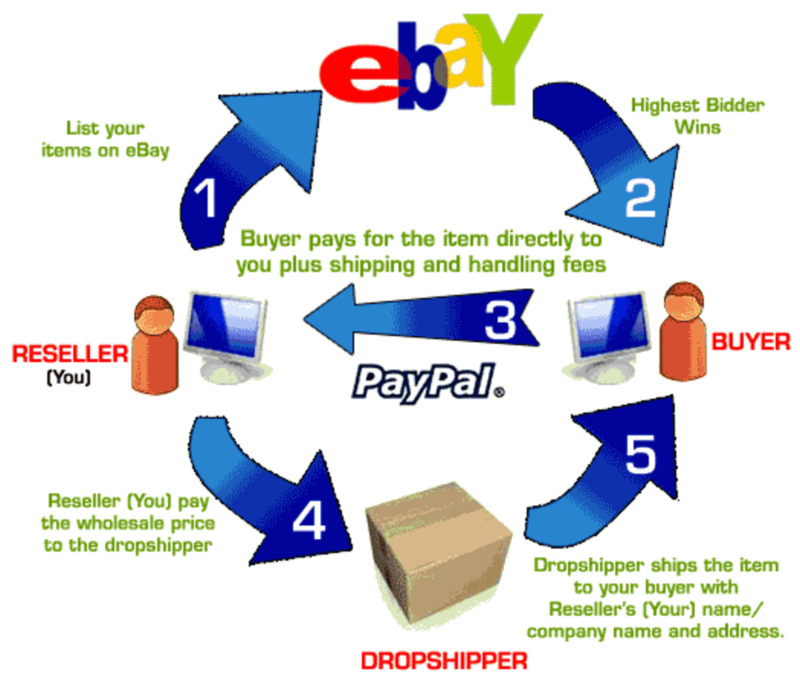 You won't have to buy or store any inventory, the company handles all inventory flow through its headquarters in New York. Of course, there's nothing wrong with getting something for yourself if you find something you like... Yes, you can buy from your own boutique! Explore at your leisure. 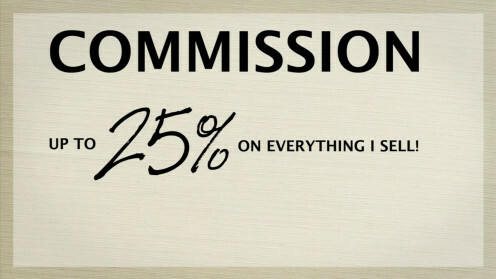 The company pays up to 25% commission on everything you sell. Any jewelry that's purchased from your boutique - even if you're buying for yourself - automatically generates a payment for you (once it's delivered and "officially" final). Commission checks are mailed to boutique owners monthly, so you can expect a regular flow of income. So, how do I sell this stuff, any way? A good place to start is an introduction to your personal social relationships. So, think... What kinds of things do you normally do with your friends? It doesn't matter what the activity may be - going out shopping, spending a day at the beach, sitting down for a quiet brunch - you're socializing! Now think of how often your friends see you wearing a new piece of jewelry and say, "Ooh, that's nice! Where did you get it?" Now you can proudly tell them that you have your own jewelry boutique. Share the website with your friends by e-mail, for example. You can even link it to your Facebook account to share your boutique on the world's biggest social network. Select "Grow my Business" for more tools and resources. 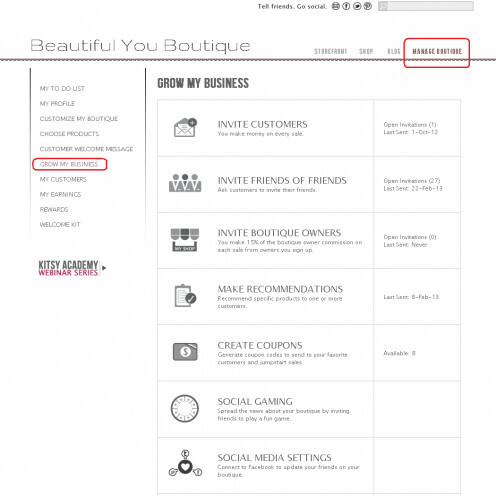 From the "Manage Boutique" tab, have a look at the resources provided in the "Grow my Business" section. From within this tab, you'll have the tools to invite customers with direct e-mail. Similarly, you can ask customers to invite their friends on your behalf. You can even invite other boutique owners to join! If you see something special that you would like to recommend to a friend, you can do so here as well. And you can create a coupon to encourage the purchase. 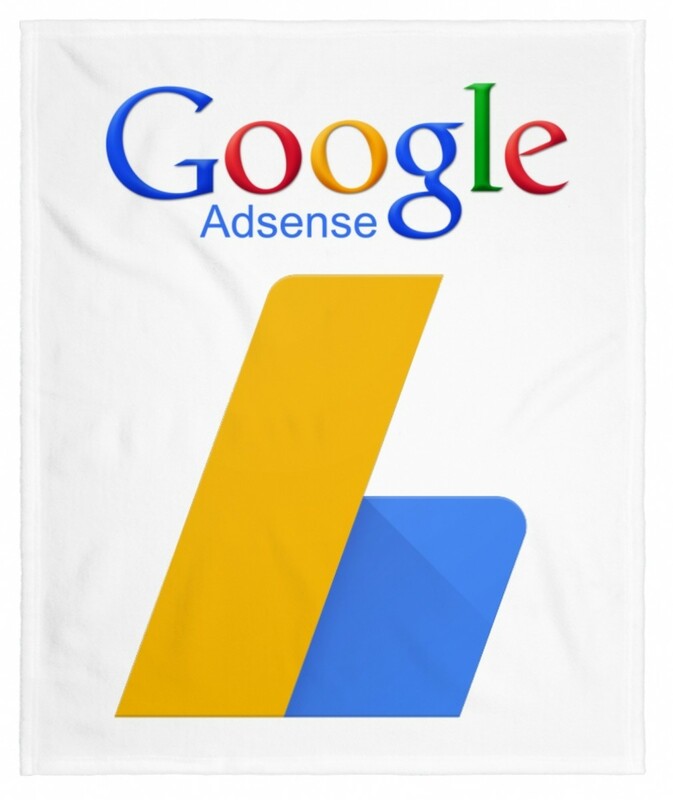 Your customers will appreciate the personal attention and the discount. This section also allows you to invite potential and existing customers to play "Jewelette," an online trivia game that features weekly jewelry prizes. Players will need to sign in with Facebook and may play as many three-round games as they please. With several customization options, this tab also allows you to print flyers for distribution to local bulletin boards or among businesses willing to display them. Don't get the idea of printing thousands of them and posting them all over town, though... these flyers should only go where they're allowed. And don't plaster them on people's cars - that's just obnoxious. 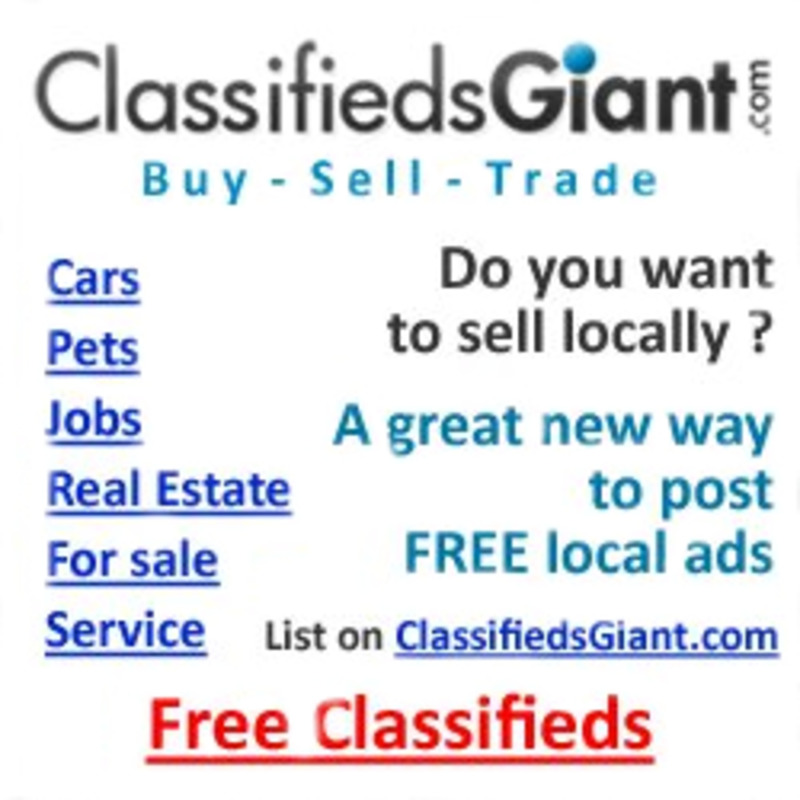 A free marketing option that is seemingly the most overlooked by small business owners is the exposure to online classified networks. Yes, that means you should try CraigsList, Backpage, KiJiJi, or the multitude of others that sprout up every so often. You can even post a free ad on "PennySaver" online. No investment... nice jewelry... an instant online presence... support from a national company... AND the ability to make money. So, what are you waiting for? Click that sign-up link and open a boutique of your own. What will you call it? Kitsy Lane went out of business! I know, because I had a Boutique set up with them and the next thing I knew they were not restocking anything and going out of business!! I bought business cards and made flyers and advertised on Facebook, and it was very upsetting to know that they didn't even let anyone know about this in advance! Well, she's off to a good start at least! Thanks, Karen. I was a little skeptical when I saw it for the first time, too... But it actually turned out to have no cost of start-up and they don't ask you to pay for anything later. Will it make anyone rich? Eh, that remains to be seen. -chuckle- But there is a little income in it so far. Interesting. This looks too good to be true, but I will check it out. You are very detailed in your descriptions so I appreciate that. Good luck to your wife.